Last week’s post, Why Housing Supply Matters, generated quite a bit of interest. I have fielded a number of requests from folks asking for similar types of analysis for their specific region of the state, among other things. What follows below are the filtering charts for three different regions in Oregon for which data is available. These so-called PUMAs, or Public Use Microdata Areas, are the lowest level of geography available for which one can download the underlying Census data and perform one’s own analysis. The standard, published Census tables can go to a much more granular geographic level of course, however you are limited in what information is available. For example, you could look at median rent or median home value by decade of construction at a more granular level, but you would be unable to look at the rent/home value distribution by decade and how those homes or apartments fit into the overall market. Additionally, keep in mind that that PUMAs have smaller sample sizes, which can result in larger margin of errors depending upon what one is examining. For example, the first two PUMAs examined today have underlying sample sizes in the 600-700 range. That’s not bad of course. The same is true for the Portland region as well, where there are more than a dozen individual PUMAs. However when we looked at the Portland region as a whole last week, the combined sample was more than 9,000. First, lets look at the North Central Oregon PUMA, which covers the Columbia Gorge, stretching into Eastern Oregon, and then down into Central Oregon excluding Deschutes County. 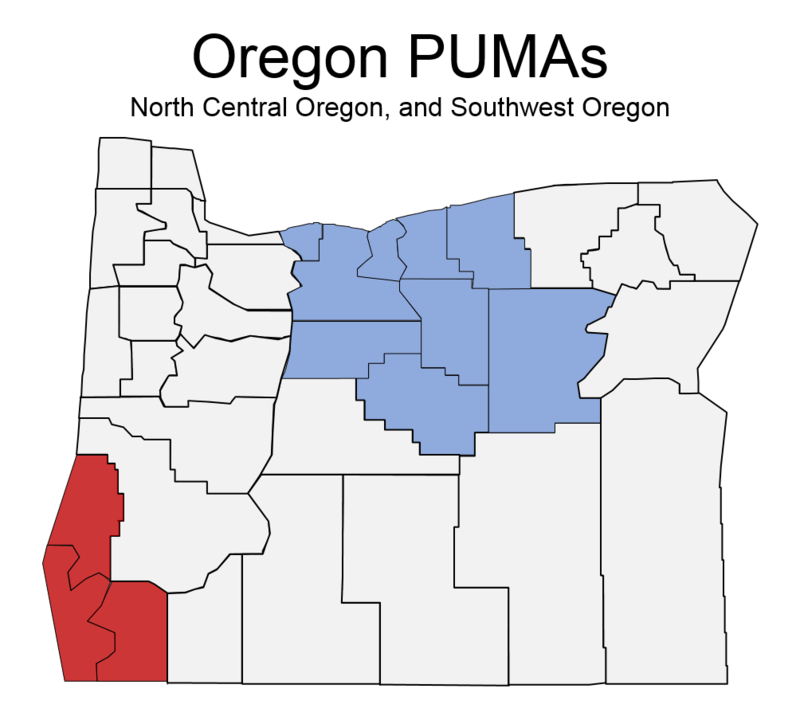 Overall, this PUMA’s pattern of growth, and filtering looks very similar to the Portland region and Oregon overall. That said, we know this PUMA contains a wide array of cities and regional economies with varying levels of economic performance. Is this chart perfectly applicable in Hood River and in Fossil? No, of course not. Each city, or county for that matter differs given their local conditions. That said, this is as good of a look as we can do for this region of the state given data availability, and, in the big picture, the same general patterns are evident. Next we turn our attention to the southwestern corner of the state: Coos, Curry, and Josephine counties. These three counties combine comprise another PUMA for which data is available. One difference seen in this part of the state is the relative lack of construction in the 1990s (at least compared to other parts of the state). This is likely part of a hangover from the early 1980s recession when the timber industry restructured. It took Coos County until the mid- to late-1990s to fully regain the total level of employment it had in 1979. So relatively less new construction in an economically hard-hit area seeing slower population gains makes sense. 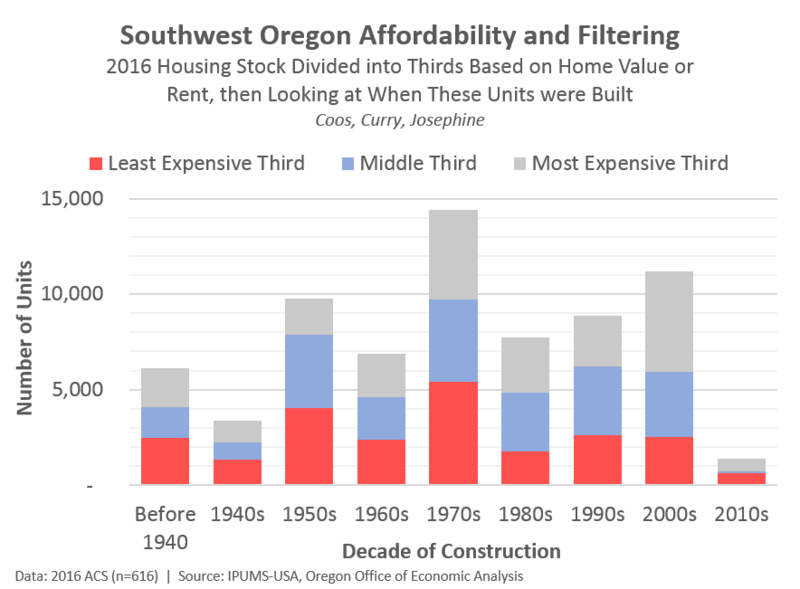 Overall, I think most of the older housing was built on the south coast, while the newer (1990s-today) is mostly going to be Josephine county construction. 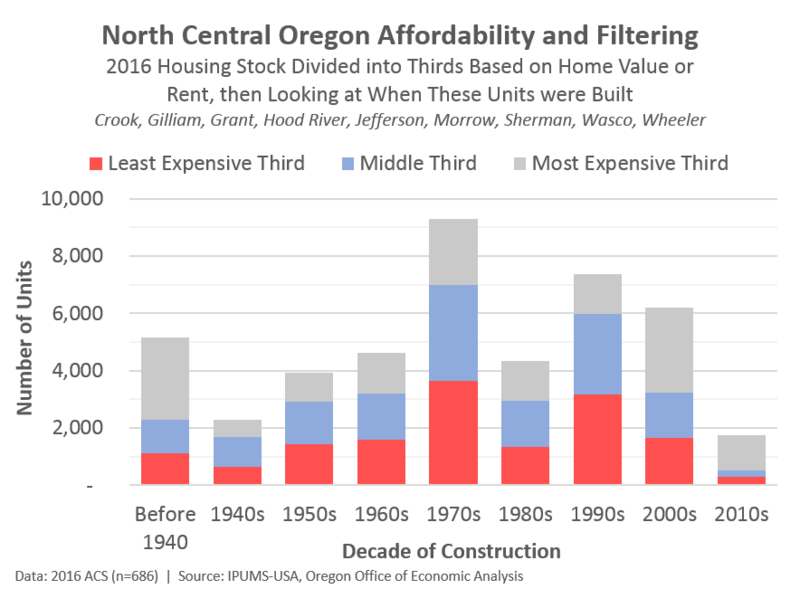 The least expensive third in the housing market in SW Oregon is rents less than $500 per month or homes less than $170,000. Finally, it can be helpful to look within a region to see how the housing stock fits together. The chart below shows the SE Portland PUMA (essentially the Brooklyn and Sellwood neighborhoods in Portland out through the Lents neighborhood). You can see the Census map here, but fair warning that it is a giant sized PDF file. I kept the price points for dividing up the stock the same as the overall Portland metro, because the goal is to see how SE Portland fits into the bigger picture. Here a couple of things stand out. First is the large stock of older housing. This makes sense particularly given these are close-in neighborhoods that have existed pretty much since Portland was founded. 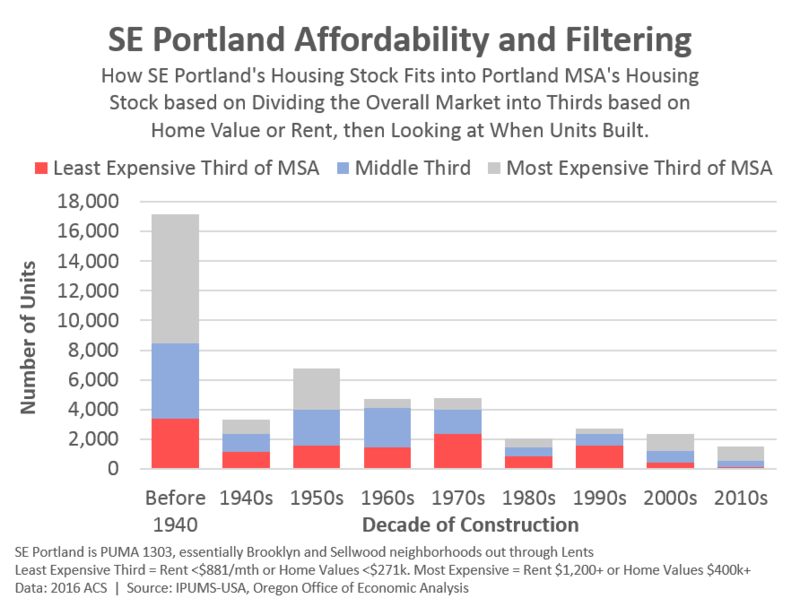 Second, SE Portland overall is about 5% of the Portland MSA’s total housing stock. However it accounts for 4% of the least expensive third, nearly 6% of the middle third, and 5% of the most expensive third. So the SE Portland PUMA is certainly average to above average in terms of housing costs, but maybe not quite as much as one might think. However, there is considerable variation within the PUMA as well, given prices in Sellwood or Eastmoreland vs Lents. This situation is similar to that of the North Central Oregon PUMA where the geographic area can mask some of the unequal distribution within the region. This goes to highlight one of the limitations of the data. Anyway, just a bit more food for thought and a few other examples along these lines. Happy holidays everyone.